I have been involved with Music-at-Hill (formerly the St Anne’s Music Society), performing in their Bach cantata-within-lutheran-vespers, or Bach Vespers, for nine years now. Yesterday I took part in a special fundraising lunchtime concert in support of the series. Typically, the Sweelinck Ensemble under Martin Knizia rehearse and perform the cantata on the day and while there is no compromise in the quality of work the musicians routinely accept a fee that is perhaps ¼ of what they might usually expect. The doughty congregation of the Vespers series contribute through a retiring collection and no doubt there is support through the associated lunchtime concert series of Music-at-Hill (a loyal body of music lovers brought together by the music making at the Lutheran church’s previous home of St Anne’s & St Agnes on Gresham St). All of this takes place at the church of St Mary-at-Hill where the idea of Bach Vespers first started so it is appropriate that this event should have taken place here. On this occasion I performed BWV 82, ‘Ich habe genu[n]g’ and Gillian Keith, who has recorded for Sir John Eliot Gardiner’s SDG Bach cantatas series, performed BWV 210, ‘O holder tag’. With an audience of over a hundred this was a well-attended event. The first indications are that it achieved the goal of raising sufficient funds to keep the series afloat into the new year. The money will be pressed into action immediately as I return with the Sweelinck Ensemble to perform BWV 139 in the standard Vespers service tomorrow evening. This entry was posted in Concert, Promotional on November 22, 2014 by CheyneyK. A month ago I took part in a recording session for music to a Christmas advert for the supermarket chain Morrisons as part of the ensemble Heritage Voices. The ad is now published and features the Northumbrian double act Ant & Dec as the ‘guests’ of a singing gingerbread man acheter viagra en pharmacie. Though we didn’t know this crucial element of the ad’s aesthetics prior to recording the vocals, I think we’ve managed a winning soundtrack for this Christmas commerical. This entry was posted in Corporate, Film, Promotional, Recording on November 20, 2013 by CheyneyK. Last month I spent a morning in a recording studio with the choral arm of the already-established Heritage Orchestra providing music for a new advertisement for IKEA. Since its release a couple of weeks ago, the clip has proved popular on social networking sites (if only as a self-promoted meme by the parent company). The advert involves vengeful gnomes resistant to the changes brought in by a couple sprucing up their back garden and features a classically-inclined cover of Motley Crue’s Time For Change. This entry was posted in Broadcast, Corporate, Film, Promotional and tagged choral, chorus, profession, session on May 11, 2013 by CheyneyK. 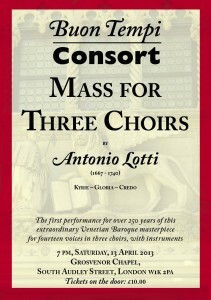 This evening I took part in a modest concert given over to Baroque mass settings by the Italian Antonio Lotti. Taking a form (concertante) familiar to that of the more celebrated setting of the Gloria by Vivaldi, Lotti’s Kyrie in C Minor, Gloria in G Major and Credo in G Minor – performed in one as a Mass reconstruction – use all or just a few of a full choral and string ensemble, with occasional obbligato oboe and trumpet. The performance at Grosvenor Chapel was given by the editor of the music we were using, Ben Byram-Wigfield, in a specially convened ensemble called the Buon Tempi Consort. And yes, we did have a good time. UPDATE 5 May 2013: The concert was recording for promotional purposes and may be heard here. This entry was posted in Concert, Promotional, Recording and tagged baroque, concert on April 13, 2013 by CheyneyK. This week I am working with a choir convened by Oxford University Press largely from the choir English Voices (right) to record a number of different works to be published in the coming year. The CD will be a sampler of the material to promote the music and sell copies of the choral parts. Composers include Bob Chilcott, Malcolm Archer, John Rutter, Libby Larsen and Jussi Chydenius. This entry was posted in Promotional, Recording on February 4, 2013 by CheyneyK. Typically for my sort of work, browsing through my diary at engagements in the new year is the quickest route to snow-blindness. Whilst January is often a month put aside in which to recover from the strains of Christmas (and do tax self-assessment) I find myself auditioning in the first week and then singing in a Bach vespers at St. Annes Church in the city with the Sweelinck Ensemble. I am joining the Sweelinck Ensemble again for a pair of Bach St. John Passions in March, one at St. Anne’s and then a second in Islington with Scott Stroman and Eclectic Voices (the former in German and the latter – billed as the ‘People’s Passion’ – in English). The following month I shall join Midsummer Opera once again to cover the role of le Baili, a father figure in Massenet’s opera Werther. In the meantime I’m looking forward to the release of a modern remake (reboot?) of Evil Dead, whose soundtrack I helped record in the week before Christmas: two hours of mistaking the sung text Satan as Santa, and vice versa (!). Finally, from the second week of January, through to the end of March I will be writing and presenting a series of programmes for Kevin Markwick’s show on Uckfield 105fm, a local radio station available online. Examples of my previous contributions to this show last year are available on the Voiceover page. This entry was posted in Concert, Film, Opera, Promotional on January 2, 2013 by CheyneyK. It’s that time of year again. The Christmas ‘rush’ got underway as I found myself singing carols at a reception in a Mayfair hotel with a quintet of colleagues. One tries to tailor the performance of carols to the needs of the client. On this occasion, we were very much a background or peripheral attraction, performing acoustically in a room of no acoustic of note whilst the guests were free to chat with one another over canapés. We have no expectation of our performance being paid any specific attention – it’s not why we were hired. For a dedicated performance, the client had brought in a ‘name’ performer (not to mention other celebrity figures to provide a focus for the event). Over the next three weeks, I will find myself in a similar range of situations from background appearances in shops or at parties and other Christmas events, to dedicated Christmas concerts for paying audiences or churchgoers. The music ranges from medieval chant to new music, from traditional carols to popular songs – everything a mix of the serious and silly, as appropriate. And I’ll wear red a lot. If you want to know more about hiring flexible ensembles to perform festive music for your organisation or event, please use the Contact page on this site. This entry was posted in Corporate, Promotional on December 1, 2012 by CheyneyK. This morning I took part in a special recording session for the music of Iranian composer Shardad Rohani. One of the indisputable perks of this job is coming across musicians of whom I have not previously heard but who are clearly significant in their field. Rohani’s opulent, dramatic, cinematic music has found audiences both in Iran and the West; besides his own music, Rohani has also found success in conducting the music of his contemporaries. I was appearing beside the London Symphony Orchestra as part of London Voices. This entry was posted in Film, Promotional, Recording on November 12, 2012 by CheyneyK. Last week I was involved in another of Opera Rara’s perennial projects to record and perform neglected works of the bel canto canon. Gaetano Donizetti’s Belisario has all the formal set pieces that one is accustomed to from performing a number of these works, the high drama set in simple but effective (and affective!) arias and duets that maximise the qualities of fine singing to the melodrama and virtuosity of act-finale choruses. This opera, like so many of Donizetti’s output, is seasoned with occasional twists of musical invention, not to mention all manner of theatrical performance arrangements – last night our ‘offstage’ band and chorus necessarily played with the main ensemble. The recording, made at the end of the rehearsal period is due out next year. This entry was posted in Concert, Promotional, Recording and tagged bbc singers, bbcso, opera rara on October 29, 2012 by CheyneyK.